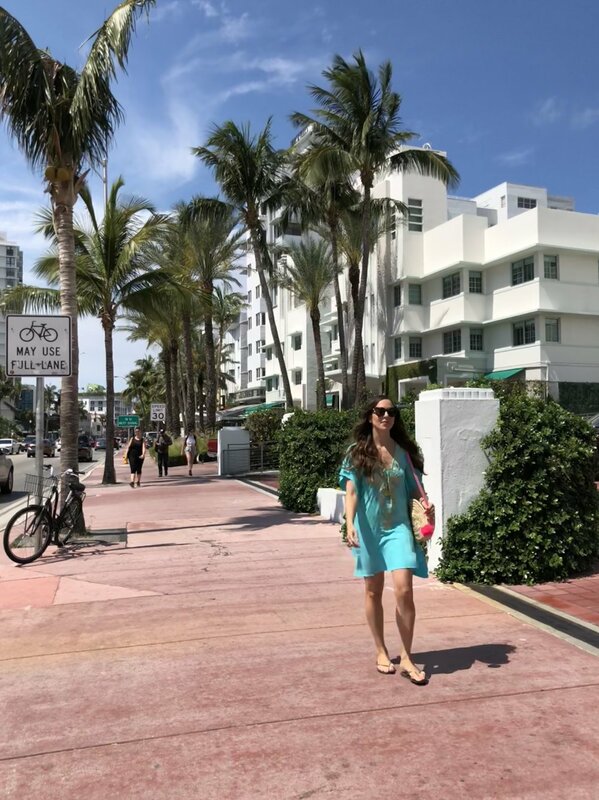 Wearing my Lilly Pulitzer kaftan, straw bag, Havaianas flip flops and Gucci shades on Miami Beach. I’ve been back from Miami a couple weeks but had so much fun photographing new looks there like this gorgeous Lilly Pulitzer turquoise kaftan, which was way less because I found it at Marshall’s!!! I am so happy Lilly is carried there now, and this was one of two beautiful new pieces I bought. I styled it with the same straw bag from the last couple posts (also a steal from the Moroccan Imports store in Chelsea Market in NYC) and Havaianas flip flops and Gucci shades for a beach day. It is such a fun look with the gold embroidery and really comfortable cotton as well. Snag yourself one before they are gone!